Welcome to the information page of Flandres biggest Militaria fair. 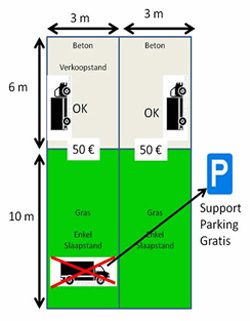 The price for participation with one fair stand and parking for the entire period is 50 Euro. 10 meters on the grass behind the sales location, only to put a sleeping tent, a trailer or a light caravan. Please note: under the caravan the used water must be collected and deposited in the containers of used water. 1 entry ticket, for each fair stand you own. Free admission for all kids -12 years. It is possible to rent a tent from the Wings and Wheels organization. This will be put up for you before you enter the event. On Sunday at 6 PM they will be taken down by the organization. Reservation via the subscription form before July 24 – 2019. The office is located at the entrance, just before entering the airfield coming from Gate 4. By passing our office we will register every vehicle by their number plate. You will receive a parking card, please display this just behind your windscreen so that it’s visible at all times. You will also receive a fair stand card, stating your name(s) and stand number. When asked for, please always show this identification card. As stated above, each fair stand you have acquired will grant you a free entry bracelet for the weekend. Our stewards will help you by putting them on. For this reasons all attendants need to be present at our office when arriving at the Wings and Wheels domain. Any extra weekend bracelets can be bought for 15 Euros each. Without wristband there is no entry to the domain. Civil vehicles are forbidden in the Wheels and Fair zone. There is a permanent exception for vehicles belonging to the organization and emergency services. A vehicle can be placed inside the fair stand, but not on the grass. Vehicles that are not placed in the stand must be placed on the support parking, just outside of the Wheels Visitor entrance. This is included in the price, but please note that this is not a camping site. All vehicles will be registered when entering the Wings and Wheels domain. Should you have the need to stay the night outside the event but close distance (500 m),then you can do this on our appointed camping places. Your mobilhome, caravan or tent, joined by one vehicle can be placed on a camping spot. This spot (from Friday AM until Monday AM) costs €25 and can be requested when you arrive at the event. Toilets, showers and non-drinkable water are included in your reservation. When payment has been fulfilled you will receive a camping card, to be displayed behind the vehicle windscreen. Entrance to the event and its domain is only allowed when you are approved by the Fair Office. After your information, ID, subscription has been validated by the office you are allowed to enter. You must enter via Gate 4, which you can find on the Map above. Stands that are not occupied on Saturday 8 AM or Sunday 8 AM, are eligible to be sold to any potential candidate buyers at that time, without refund to the original buyer. A stand that has not been paid before closing date (25th July 2019) will have an extra cost of €35 per stand. The stand location will stay reserved for last year stallholders until 1st May 2019. After that they will be released for other potential or new candidates. Only military, antiquities, military vehicles and parts, freely available weapons (only if you are an authorized trader or collector), vintage clothing and antiques are allowed to be sold. Following the Royal decree of 8th May 2013, adaptions were made to the Royal decree of 20th September 1991, with reference to the sale of historical, folkloristic and decorative weapons (HFD weapons). For more info on sales of weapons, please refer to our Fair Legislation on weapon sale. It is forbidden to sell, trade and/or display any object that can be, or is imagined to be, related to racial politics or xenophobia. Outside of the Fair zone there is a strict prohibition on sales and trading. Selling fireworks, signal guns or any pyro technical objects is forbidden. Each stand owner needs to comply with the Belgian law, and in particular the Belgian Tax law. Nor the organisation, nor its employees are responsible for any stand owner that does not meet any administrative requirements, should the government do a investigation. Upon subscription, each stand owner accepts the Wings and Wheels Terms and Conditions. Each stand owner needs to comply with the Fair house rules. When ever somebody does not act by the house rules, the organisation will not allow entering the event or will remove that person out of the event. Each stand owner is also responsible for protecting its property. The organisation cannot be held responsible for any damage, theft or loss of objects. Official authorities will actively perform security checks on the Fair grounds should there be any rule breaking. Subscribing your Fair stands can be done via the following page: Subscribe Fair. Please enter all the required details and further follow-up will be done via e-mail. A confirmation of receipt of your subscription will be sent to you via e-mail. Please note, that subscribing your Fair stands, and attending to the event is subject to our Terms and Conditions.